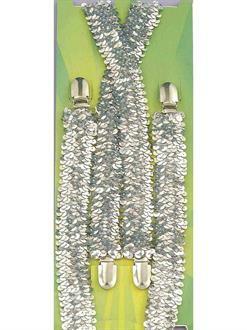 Add sparkling style to your Halloween costume with the Silver Suspenders For Adults! These spectacular suspenders are covered in silver sequins and are great for taking your gangster, clown, or mime costume from drab to dazzling. You’ll adore these suspenders so much that you’ll want to make them a staple of your everyday wardrobe!